Having simple go-to meals is essential in trying to keep a healthy plant based lifestyle. Some days you are going to have more time to prep elaborate meals and others you just want to use what you have in the fridge and pantry to whip up something satisfying and delicious, without destroying your entire kitchen. Before changing our diet one of my easy husband-approved meals were tuna melts, which consisted of sliced bread, a mountain of tuna salad, and a nice thick block of sharp cheddar baked in the oven until the cheese was melted over the sides. The tuna salad was pretty basic; caned tuna with as much mayonnaise that was necessary to make it goopy, a splash of mustard and relish, and a couple of pieces of red onion and celery for some texture. 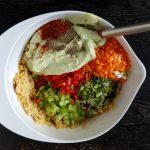 It was easy to throw together but always left a heaviness, and part of me always struggled with the internal dialogue debating the necessity of the heavy fats to moisten and add richness to the dry and lackluster tuna. I always came out the other side with “but tuna is a great sources of protein” so my mind cancelled any other negative thoughts. 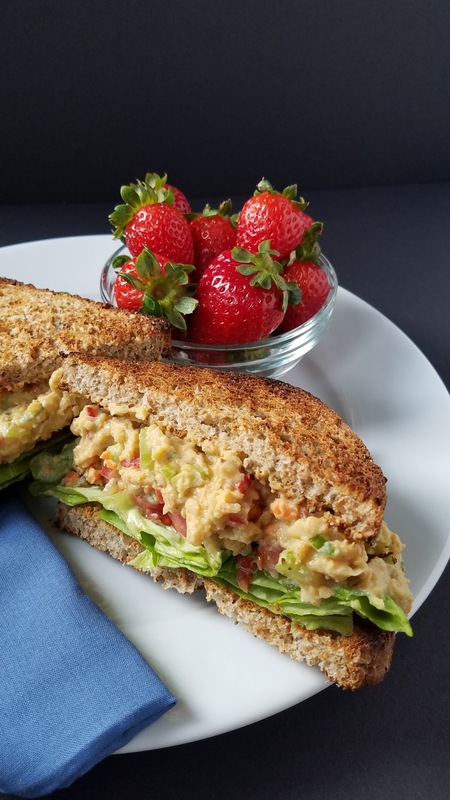 Tuna salad is a staple in many peoples homes, because it is convenient, and is considered an excellent source of protein. I wanted to recreate that convenience and promote a more well rounded powerhouse of nutrition. 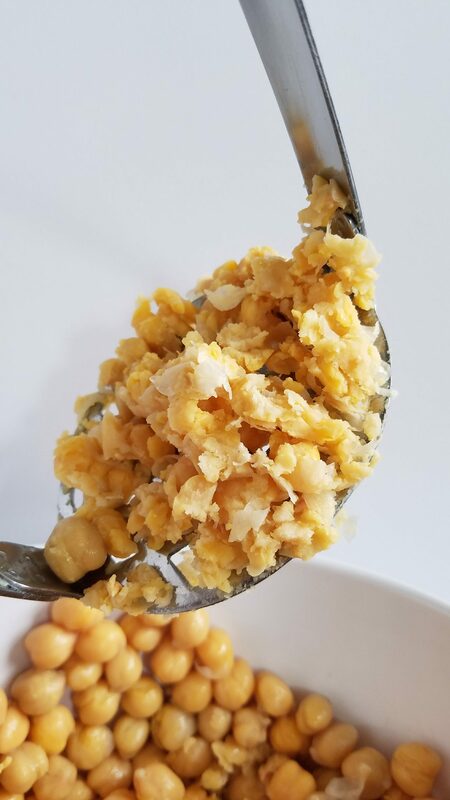 Replacing canned tuna with canned chickpeas (Garbanzo Beans) was a simple switch. 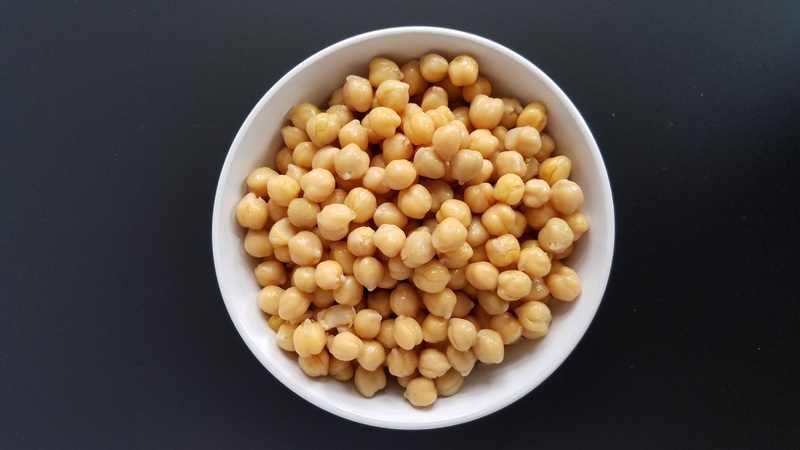 Chickpeas are loaded with protein and unlike tuna they come with tons of fiber (and they don’t stink!). 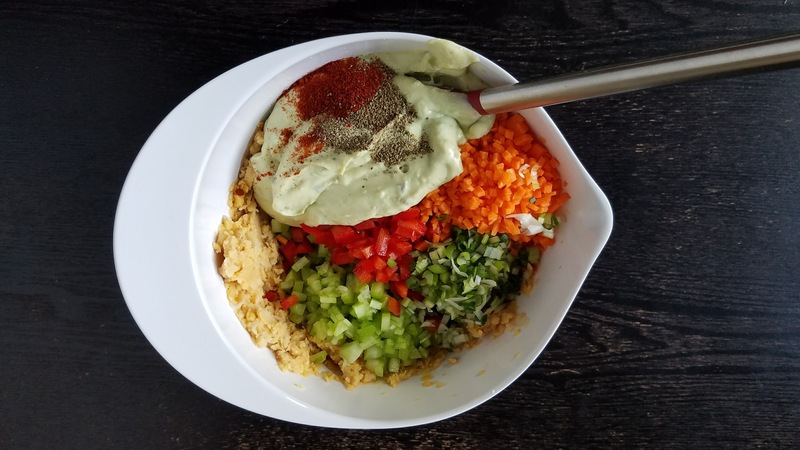 You could easily use a vegan mayonnaise as your creamy base but it is very calorie dense, without a lot of beneficial nutrients. Utilizing silken tofu, which I always keep in my pantry and ripe avocado I created that silky, creamy mouth-feel of mayonaise without the empty calories of oil. 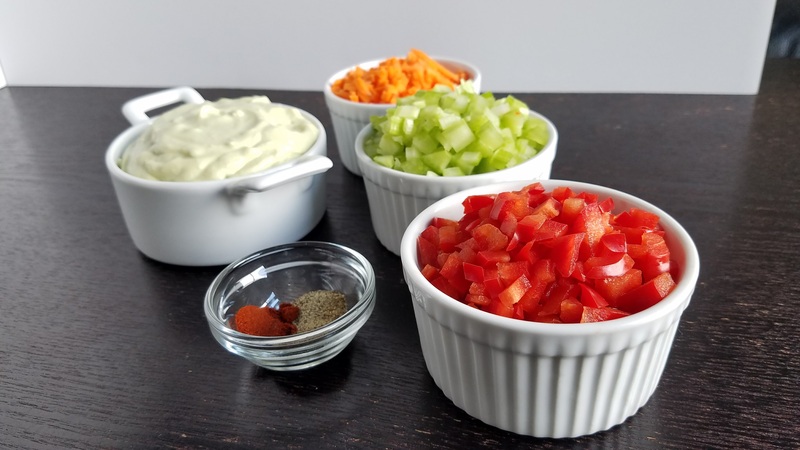 Using simple ingredients like carrots, bell peppers, celery, onion, mustard and relish you can make a nice meal at home or an on the go snack. This dish is creamy, savory, satiating, and delicious! Keep this salad in the fridge for whenever your hunger strikes. It can be enjoyed on its on, over a bed of your favorite greens, stuffed into a wrap with fresh tomatoes, and tons of sprouts or the way my husband prefers it, in a massive bowl with two sleeves of Vegan Butter Crackers…to each his own. You can adjust the seasoning to your taste preferences, I like it with more mustard, my husband likes it heavy on the relish. Make it yours! A delicious and healthy alternative to your classic tuna salad. 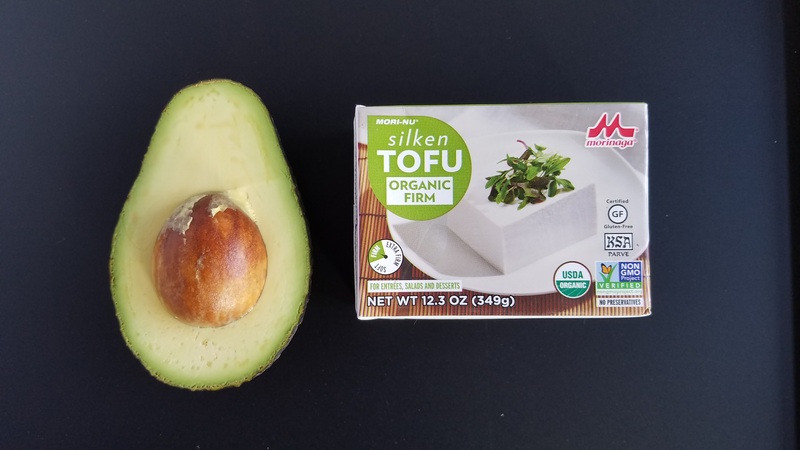 Use it as a dip for crackers, and a perfect filling for an easy sandwich! Prepare and chop your carrots, celery, bell pepper, red onion and scallion and place in a small mixing bowl. Set Aside. Using a small immersion blender or food processor, blend the avocado, tofu, apple cider vinegar, lemon juice, and mustard until smooth. Strain and wash your garbanzos, and place in a medium mixing bowl. With a potato masher or a fork mash the beans until most are broken up and it starts to resemble tuna salad. You don't want it to be smooth but textured and chunky. Season the beans with a pinch of salt and pepper. Add the chopped vegetables, avocado-tofu cream, and the remaining spices and relish and mix well. Taste and adjust according to your preference.